We all know that natural disasters such as cyclones can have devastating effects on our reefs. Even though tropical cyclones are part of nature we do have to realise that with the global climate change the border between 'natural' and 'human impact' becomes blurred and the incidences of extreme weather patterns such as Category 5 Tropical Cylcone Yasi and the recent floods we have seen in Queensland and Victoria will become more frequent. What does this mean for the Great Barrier Reef and consequently the livelihood of people who are dependent on the world's largest reef system? The northern end of the 2600km Great Barrier Reef was directly in the path of Cyclone Yasi. 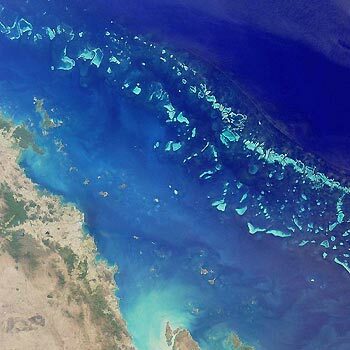 The Great Barrier Reef is composed of 2900 individual reefs and stretches over an area of 344,000 square kilometres. The immediate effect would be the physical damage to the reef. It is the fast growing coral such as the Staghorns that get destroyed by storms and slow growing more solid coral such as Brain Coral generally get spared by the physical effects of storms. In addition to the physical damage to the reef by this massive storm there are the huge problems of excessive runoff of sediment after months of Queensland's floods, followed by another bashing by flooding from the storm surges created by Cyclone Yasi. Since the actual coral reef is formed by filterfeeding organisms this will result in the demise of many more corals, other filterfeeders and loss of habitat for many more organisms and their predators. Adding to that are consequences of a decrease in salinity following heavy rains, which add more stress to the reef. We are all aware of the fragile state of the world's coral reefs triggered by global warming, ocean acidification, excess nutrients, overfishing, the list goes on - and any additional stress will add to the danger of this huge ecosystem by shifting the fragile balance towards non-sustainability. What Yasi really did to the Barrier Reef will take a while to find out. Major damage caused by Tropical Cyclone Larry was to underlying reef structures, breakage and displacement of corals, which is overall consistent with previous tropical cyclone events. One hope could be my personal theory that if the cyclone passed over the barrier reef at high tide, much of the storm damage could have been minimized, but it is not until we get out there in weeks and months to come that we will be able to survey the impact of this natural disaster on the Great Barrier Reef. Another positive thought is of course that the destructive path of Yasi was limited to the part of the reef it crossed over and a large part of the Great Barrier Reef will have been left untouched by the immediate effects. Queensland's tourism industry has been devastated by the events of late 2010 and early 2011 and we hope everyone will remember quickly Queensland's motto: beautiful one day, perfect the next! The Great Barrier Reef is a 'must see' on everybody's Australia travel itinerary and this should not change after Yasi. Our thoughts go out to all of those personally affected by Cyclone Yasi.